Nick’s Gluten Free Diet; His Ultimate “Cure” for Celiac Disease! So we had our answer; maintain a life long gluten free diet. Not as easy as it sounds because gluten is everywhere. It’s in bread, pasta, flour, pizza, desserts and even in sauces. Wheat based foods are as common as apple pie, and yes gluten is in that too! Do you have any questions about Nick's GF Diet? Click here to ASK! So how did all of us react when were informed about Nick’s new “life long” diet? Not too good at first. When Nick’s doctor told him all he had to do was to eliminate gluten from his diet, at first we thought; no big deal. Well, after we started to understand that gluten was found in just about every food, we felt pretty devastated that our son was no longer able to eat pizza and have birthday cake. At first we felt shocked, then even depressed. If you think we felt bad, think how an 8 year old kid feels knowing he couldn’t eat his favorite foods anymore? Frankly, he was more angry than anything. Soon after the doctor informed us about the gluten free diet, he had a Nutritionist come over to talk with us about the different options that were available to Nick. Over a few minutes of listening to her, we started to feel a little better because she told us that rice was gluten free, it was the main substitute for flour and there were many rice based foods that he could eat. She also told us that Nick would start to see immediate improvement in how he felt everyday just by completely eliminating gluten from his diet. Those made us and him feel even better since he was so sick and tired of all the complications from his numerous symptoms. However, she warned us that it is going to take time and there will be a level of frustration that you all will have to overcome, but it will happen soon after seeing the results. The first thing the Nutritionist gave us was a safe food ingredient list and an unsafe food ingredient list. (click on these links to see these lists). We brought the lists home and studied it for a while. The next day, we developed our first grocery list and it marked the beginning of a new healthier lifestyle for Nick! So where do we shop for his gluten free foods? You know 6 years ago, shopping for GF products was much more challenging than it is today. Back then, most grocery stores only offered a very small selection of GF food in the Natural Foods section. Some stores didn't even carry one single GF item! Today, it is much different. Most local grocery stores now carry many more GF items. For example, at first we had to buy GF rice dough and mix it to make our own gluten free pizza shells. Today, you can buy the shells all ready made and you can now even buy frozen GF pizza that you can just put in the microwave or stove. Today we buy nearly all his food at local grocery stores. However, we do buy GF products online. 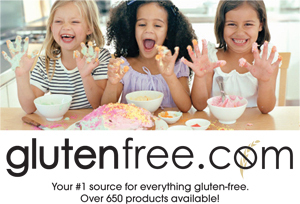 One of our favorite online stores is the Gluten Free Mall. This online store offers a complete offering of GF food. Anything from breads to snacks to bake goods. Start your own E-Business from Home! Learn how I built this website! Want to build your own website? Turn your passion into your own E-Business! It's easy!! I built this website: www.gluten-free-for-life.com from home!! 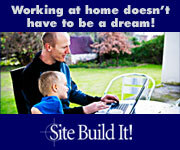 Click on the link below and see how you can build your own site and start your own e-business from home! Learn How I Built This Site! !